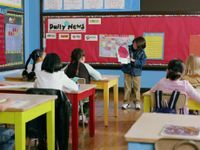 Even in a highly-structured classroom environment, you can foster creativity with strategies like possibility thinking, divergent thinking, encouraging student interests, and collaborative learning. How do students learn to challenge ideas and think beyond the status quo? Can creativity be fostered in classrooms that follow Common Core standards and test for conformity? At first glance, these questions may seem at odds. And, in fact, many educators believe that today's schools have abandoned the concept of creativity. Yet teachers can and do foster creativity in standards-based classrooms every day. In the past decade, a new science of creativity has emerged. Neuroscientists are turning previously-held notions of creativity on their heads, including the fact that creativity does not involve just a single side of the brain. Most scientists agree that creativity must be defined by more than the sum of its parts, which include but are not limited to originality, self-expression, risk taking, intelligence, autonomy, collaboration, and imagination. We depend on our creative abilities to help us adapt and thrive in increasingly complex and uncertain times. Researchers also believe that a creative life fosters happiness and well-being, and that there is a significant connection between creativity, meaning, and intrinsic motivation. Creativity is at the epicenter of human exploration and discovery, an ability used to generate and communicate original ideas of value. Inspired by our senses of sight, sound, taste, touch, and smell, creativity is a force that nurtures human development, innovation, and an aesthetic appreciation of the world around us. Many people associate creativity with those who are gifted and talented. Few would argue that Steve Jobs' creativity helped produce the iPhone and other innovative Apple products. But creativity is not confined to people of extraordinary intellect or talent -- or to big inventions. Everyone has creative capacities that evoke originality, like producing a new recipe, conveying a powerful idea through self-expression, or discovering a better way to achieve desired outcomes. We are beginning to learn new ways in which creativity is fostered during childhood and adolescence. In an excellent blog post on the science of creativity, Diane Cadiergue shares surprising concepts about nurturing creativity, including that memorization is necessary to build a student's ability to generate original ideas. In The Systems Model of Creativity, Mihaly Csikszentmihalyi suggests that talent may be of less importance than encouragement. He cites a wealth of research showing that when adults devote time and energy to children's overall development, they also help young people develop creative talents. 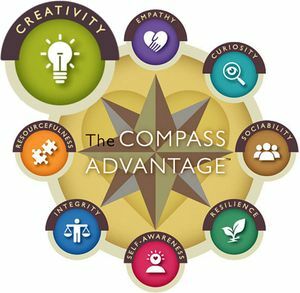 Creativity is part of The Compass Advantage™ (a framework designed for engaging families, schools, and communities in the principles of positive youth development) because the ability to explore, discover, and express new ideas of value to ourselves and others is an integral part of personal growth, happiness, and lifelong learning. Linked systemically by research to each of the other Compass abilities -- especially curiosity, resilience, and resourcefulness -- creativity is one of the 8 Pathways to Every Student's Success. To foster creativity in classrooms, teachers must understand how creativity originates. It is not enough to give assignments with teacher-perceived creative outcomes in mind. What is most important is to teach the thought processes and attitudes of mind associated with creativity, which include the exploration of intrinsically meaningful ideas as perceived by students. The suggestions below focus on the types of processes and attitudes that spawn creative thinking. 1. Experiment with possibility thinking. Pose the question "What if?" in as many ways as possible, helping children naturally think of creative possibilities. This involves a shift from more traditional approaches that encourage students to ask, "Why is this and what does it do?" to having them ask, "What can I do with this?" For further details on this questioning technique, see Chapter 14 of Nurturing Creativity in the Classroom by Ronald A. Beghetto and James Kaufman. 2. Provide opportunities to explore individual interests. Invite children to choose individual projects that hold special interest to them. Why? Creativity blossoms when children feel invigorated by activities they enjoy. For example, if a student loves playing flute, encourage him to write a paper on the history or mechanics of flute playing. If a child loves soccer, provide an opportunity for her to do a creative project about soccer. 3. Develop five core attitudes associated with creativity. In her book Creativity for 21st Century Skills, she provides a number of ways for teachers to embed these attitudes in the classroom, including the use of diary-like journals that help students reflect on their thinking to promote creativity. 4. Engage students in collaborative learning. Encourage students to work together in groups. While creativity is associated with individual talent, we draw inspiration from other people's ideas and from our cultural surroundings. Great inventions and creative breakthroughs are most often the result of collaboration between people who have similar goals but diverse ways of thinking or seeing the world. Creative processes are at work when students pool their collective talents to solve a problem. Choose a sentence or short paragraph from a class reading assignment that holds different meanings for different people. Ask students to imagine the many different ways in which those words might be interpreted by people from diverse cultures, ages, or life experiences. The goal of divergent thinking is to generate as many different ideas as possible about a topic by exploring a multitude of possible solutions. In his excellent paper on how to encourage divergent thinking, Dr. Daniel Raviv of Florida Atlantic University outlines a number of activities that improve high school students' divergent thinking. Many are appropriate for younger students. 6. Help students make connections. Give assignments that encourage metaphorical thinking to express complex ideas or solve a problem. The use of metaphors helps students gain new insights and challenge assumptions. Students who learn to connect seemingly unrelated ideas, thoughts, and concepts develop the ability to synthesize information in creative ways. Explore other creativity tools at MindTools, a website designed for businesses, but also a place where teachers can use their creativity to adapt the many brainstorming and idea-generating tools for their classrooms. What other ways do you foster the thought processes and attitudes of mind associated with creativity in your classroom?